Since 2008, Metropolitan Room has been producing a critically acclaimed competition, MetroStar Talent Challenge and has launced many careers as a result. Invited to perform are the winners of each of the competitions all the way back to its innaugural show. Backed by a four piece band, this star-studded show promises to be a night to remember. It’s a MetroStar reunion! 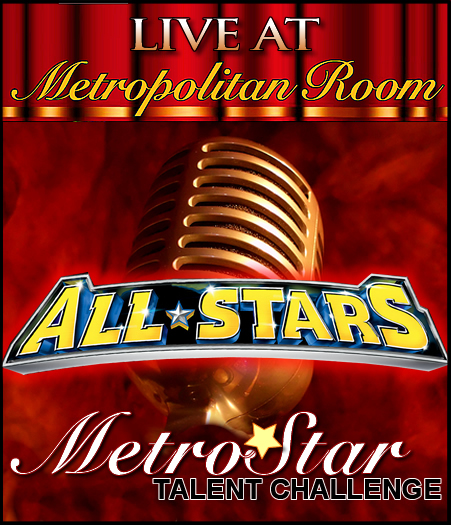 In a one-night-only special engagement on Monday March 16 at 7pm, the Metropolitan Room welcomes back all seven MetroStar Talent Challenge winners going back to 2008 when the prestigious competition was first held. The evening’s all-star roster includes Anne Steele (2008), Liz Lark Brown (2009), T. Oliver Reid (2010), Marissa Mulder (2011), Billie Roe (2012), Lauren Stanford (2013) and Kristoffer Lowe, the reigning MetroStar. Backed by an all-star band of four led by competition’s frequent music director Tracy Stark, the MetroStars will sing songs they tackled when they competed, as well as new material they’re currently working on. Met Room owner Bernie Furshpan is the evening’s host. The non-competitive evening will also feature memories and anecdotes about the competition, held every July and August. The contest -- which is open to singers of all ages, backgrounds and styles -- is widely acknowledged to have propelled several of the winners, as well as several of the runner ups, to the upper ranks of the cabaret industry. The contest has recognized both exceptional newcomers and several veteran performers. Each winner followed up their wins with major engagements produced by the Metropolitan Room. The jury-and-audience-voted, elimination-round competition encourages singers to present well-rounded stage performances in which creativity, innovation and authenticity are prized over vocal fireworks. MetroStar’s permanent judges over the years have included Rob Lester, Carolyn Montgomery-Forant, Gretchen Reinhagen, Eric Michael Gillett, Joseph Macchia, Tanya Holt, Sherry Eaker, Klea Blackhurst, Baby Jane Dexter, and the Metropolitan Room’s founding owners Christopher and Steven Mazzilli. Critic Roy Sander has served as jury chairman since the beginning. Jay Rogers and Tom Gamblin have been the contest’s hosts in recent years. The Nightlife and Bistro Award-winning Metropolitan Room has been keeping kids off the streets and adults from spending too much time watching television since 2006.